Western Digital has launched the SanDisk iXpand Mini Flash Drive for the iPhone and iPad. The drives are available in 16GB, 32GB, 64GB and 128GB storage options, with prices ranging from Rs. 2,750 to Rs. 7,050. The drives are exclusively available with Flipkart. The drives comes with a Lightning connector and a USB 3.0 connector letting users move files between their iPhone/iPad and a Mac/PC. Western Digital Corporation, a global storage technology and solutions provider, today released its latest mobile memory solution for iPhone and iPad, the SanDisk® iXpand™ Mini Flash Drive. The new offering expands the company’s portfolio of mobile storage solutions, which includes the award-winning SanDisk iXpand™ Flash Drive, offering users an additional design option, ideal for those that need to back up files or instantly free up space for more photos and videos on their iPhone or iPad. 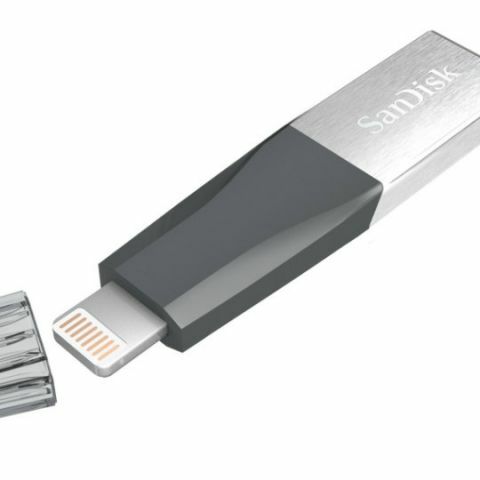 The SanDisk iXpand Mini Flash Drive is equipped with a Lightning™ connector and a USB 3.0 connector so users can quickly and easily move files between iPhone or iPad and Mac or PC computers. The new flash drive features a modern and compact design, a high capacity of up to 128GB*, and fast read speeds of up to 70MB/s**. With the advancements in iPhone and iPad camera and video functionality, people will continue to produce content at astonishing rates, and may need even more space to save all their memories. The SanDisk iXpand Mini Flash Drive is designed to meet these physical storage needs and enables users to capture, save and share content without limits. Designed for heavy-content users, the SanDisk iXpand Mini Flash Drive features an award-winning companion app, the iXpand Drive app for iPhone and iPad, which offers new features and an improved user experience. With the iXpand Drive app users can automatically back up2 their camera roll, content from social networking sites including tagged photos from Facebook and Instagram2, and watch popular video formats straight from the drive3. Additionally, people can cast content from the SanDisk iXpand Mini Flash Drive to their television via ChromecastTM device or Amazon FireTM directly from the app. The app is available for download from the App Store for iPhone and iPad, and launches when the SanDisk iXpand Mini Flash Drive is plugged into an iPhone or iPad – allowing for quick access to the user’s content and easy file management. The new design of the SanDisk iXpand ™ Mini Flash Drive lets you connect it directly to your iPhone or iPad without having to remove the case. The drive also includes encryption software that password-protects files4, allowing people to share their content while helping keep sensitive files protected across devices. The SanDisk iXpand Mini Flash Drive is now available in India in 16GB, 32GB, 64GB & 128GB capacities, with MSRPs starting at INR 2,750 to INR 7,050. The new SanDisk iXpand Mini Flash Drive is available exclusively with Flipkart. The new SanDisk iXpand Mini Flash Drive features a two-year limited warranty.